I got my first and, for 28 years, only speeding ticket in 1987. I was student pastor of a small United Methodist Church in rural southern Illinois called (I'm not making this up) Seed Chapel. I had just learned that one of my parishioners had suffered a heart attack and been taken by ambulance all the way from Oblong to Urbana, as Crawford County's only hospital couldn't begin to address his needs. For the first time in my shortish career, I had an urgent mission: to drive to Urbana and do all the things ministers do when they make a hospital call. It's almost a hundred miles from Oblong to Urbana--the same distance as between Portland and Eugene--so I had a big day ahead of me, and I was eager to get started. I left Oblong faster than I realized, accelerating to 40 while still in the 30 mph zone. A police car passed me headed the other direction. Its lights went on almost immediately, it executed a quick u-turn, and came up behind me. I pulled over, admitted I was driving to fast, and was told by the officer I could either pay the ticket now or go to jail. Yes, that's really what he said. I didn't have the cash for the $50 ticket, so he followed me back into town to the bank where I made an ATM withdrawal and paid him. My name appeared in the local newspaper along with all the other misdemeanors on the police blotter, and my church had a good laugh about it the following Sunday. "Why didn't you tell him you were going to the hospital?" they asked me. "He would've let you off." All I could say is that it never occurred to me because he had me dead to rights: I was ignoring the speed zone, and it just didn't feel right to take advantage of my pastoral identity to get away with breaking the law. In the 28 years since then, I've been pulled over several times. Humility and my status as an increasingly middle-aged white male have probably been the main reasons I've received only warnings on these occasions, none of which really seems fair to me: I've deserved those tickets. Either I've knowingly been driving over the speed limit, or my car's six cylinder engine has been feeling its oats and I've been lulled by the smoothness of the ride into going faster than I realized. And probably the longer I got away with it, the easier it was to convince myself it wasn't going to happen again. And then, three weeks ago, a robot caught me. Twice. I've known about photo radar for many years. I've seen many a red-light-runner get flashed by the cameras at busy intersections in Portland. 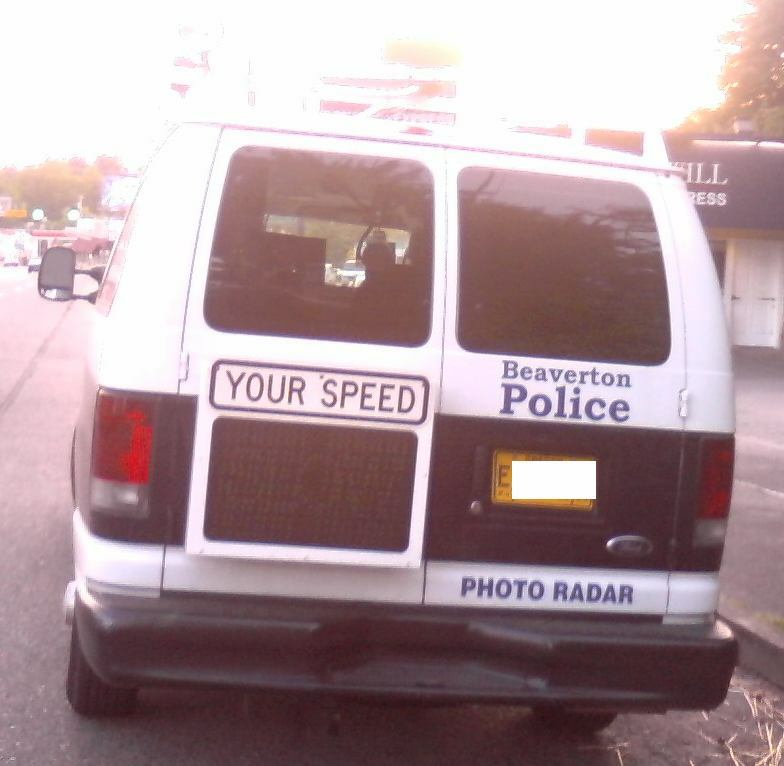 What I hadn't known about was the portable photo radar Beaverton has taken to moving around town. One morning while it was still dark at 6:20 AM--my usual commuting time--I was zooming down a stretch of 143rd that has a posted limit of 40. The light on Cornell was green, always a pleasant surprise, and I zipped around the corner, cruising past the dark and empty edifice of Sunset High School, in the parking lot of which was a photo radar van. There was a bright flash. I glanced at my speedometer-44--then up at the speed limit sign I was passing--30--and allowed myself to hope it was just an equipment test. Two days later, I was heading down Cedar Hills Boulevard, on my way to a workout at the Beaverton 24-Hour Fitness, when I passed another van. This time I was traveling at 42 in a 35 zone. Again, I hoped nothing would come of it, or perhaps that it was the car in front of me that had been tagged (though the light flashed several times after I passed the van, as well--a lucrative day for the Beaverton Police Department). For a week, I crossed my fingers, started breathing easier. And then came the first letter, which contained photos of my car, my face plainly visible, and my license plate, as well as a $160 fine. Two days later, the second letter came, and again, there was no pretending that was not my car or my face in those pictures. This fine was $110. I paid them both. Oh, I sent in letters of explanation, throwing myself on the mercy of the traffic court, hoping the fines might be reduced. But it never occurred to me to question either of these tickets, or the unfairness of a mobile robo radar. I had this coming. So did the other drivers who were tagged that second day. People drive too fast, endangering pedestrians, bicyclists, and other drivers. It's the job of the police to slow us down. Clearly the friendly warnings of the cops who pulled me over weren't doing the trick (though once given one, I was always far more careful about my speed on the stretch of road where I'd been warned--just not anywhere else). Never knowing where I might be caught by a robot is a whole other matter, and it's got me paying attention to speed limits all over the metropolitan area. My professional ethics are not happy with this. Fear of punishment is the most extrinsic of motivations. And it's not as if I have no empathy for those endangered by my speedy traveling preferences: I've shaken my fist at many a reckless driver who almost clipped my bicycle or forced my running feet into a ditch, and I've had plenty of aggressive speedsters ride my bumper. The words I most often yell at rude drivers are "Slow down!" Why should it be any different for me when I'm behind the wheel? That's the main reason I'm not grumbling about the unfairness of my robo-tickets. They're a wakeup call for me--as will be their likely impact on my car insurance. I've complained for many years about drivers who hazardously pass me on a busy highway, only to have me end up right behind them at the next stoplight. Is the half second of travel time you just saved really worth endangering all our lives? Of course not. Nor are the few seconds I saved on my commute by coming around that corner so fast. If driving the speed limit means a longer commute, then I need to leave the house earlier. The judge may yet take pity on me, and issue a partial refund for the $270 I mailed in last week. If he or she does, I'll be happy to put the money back in my checking account. If not, I'm not complaining. After all, I had it coming.